Estate Mariposa is located on the north side of the Bay of Banderas and secluded from the rest of the development in Punta Mita, Ranchos Estates is the most exclusive estate development in this world, renowned resort community and just forty five minutes from Puerto Vallarta airport. This beachfront property is a spectacular estate home offering luxurious sleeping accommodations with five bedrooms, sleeps ten. Indoor outdoor living at its finest having over 16 000 square feet of living space, with separate bedroom bungalows set in a fantastic mature tropical garden with exceptional privacy. The modular design, along with interior gardens, and three fountains compliment the spectacular natural setting. 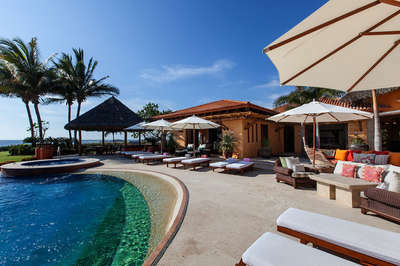 Estate Mariposa has 185 feet of beach frontage facing south west on Banderas Bay. Estate Mariposa has Premier Punta Mita Club Membership for access to both Punta Mita Nicklaus designed golf courses, Bahia and Pacifico, to the Punta Mita fitness centre, and to both the Residents’ and Kupuri Beach Clubs. You will enter the villa through two massive copper latticed doors to a palapa covered casual living area. The palapa is next to a large infinity pool and spa which overlooks the sea with spectacular views. There is seating for eight around the coffee table, a card table for four, sofa seating for five on the wooden deck, sunning lounges for five on the deck, and stools for five at the bar with nearby powder room. The four large principal rooms, living room, dining room, kitchen and media room, are all on the lower beach/garden level to enjoy separation from activities of the pool and bar level, but without giving up sunset viewing. A fully equipped modern gourmet kitchen includes a scullery, walk-in cold-room, outdoor grill, and adjacent pergola covered terrace for outdoor dining. Guests of Estate Mariposa benefit from the highest level premier golf membership providing access to Pacifico Golf Course, Bahia Golf Course, tennis centre, fitness centre, Residents' Beach Club and Kupuri Beach Club.